Grace Design is highly respected in the audio industry for its microphone preamps, converters, and monitoring solutions. I was first introduced to Grace while working with an m201 at a studio in Boulder, Colorado. Certain traits stuck with me — clean, transparent, high headroom, great transient response, and very low noise. That Grace has since become a workhorse preamp for me in the studio; its reliability and consistency has kept me coming back time and time again. After having such a great experience with the m201, I was very excited to get my hands on the FELiX. FELiX is a brand new release from Grace, which covers new ground by bringing its high quality, studio-grade preamplifiers to the stage. This two-channel acoustic instrument and microphone preamp comes armed with a versatile EQ section and blender. The FELiX, like all Grace products, features a slick and pristine design equipped with silky-smooth pots and durable footswitches. The pots on the faceplate are certainly roadworthy, with clearly marked labels for easy identification on a dark stage. The floor unit chassis is made with anodized aluminum and steel, and is built like a tank to thrive in the studio or on the road. The front panel follows signal from left to right. The two rows of pots control two independent instrument channels, which can be blended into one output or can be used as individual channels (more on these configurations later). There is an XLR input for channel 1, as well as 1/4″ instrument inputs for either channel. The input LED indicator flashes green when signal is present, and turns red before clipping. Both channels have alternate impedance settings for different types of pickups, accessible from a toggle switch on the back panel labeled ‘Z’. Next comes the EQ section. The first band is changeable between a highpass filter and a low-frequency notch filter. This is selectable from DIP switches 1 and 2 on the side panel for channels 1 and 2 respectively. The HPF (for those of you keeping score at home) is a Thomson-Butterworth filter with a 12 dB/octave rolloff. It does a great job of cutting unwanted rumble and mud out of the signal. It ranges from 20 Hz to 1 kHz, so you have plenty of flexibility for any instrument. The notch filter, which has the same range as the HPF, is very useful to remove specific problem frequencies that can be causing potential feedback on stage. The low and high bands each have a gain control (Â±12 dB, detented at 0), and fixed frequency shelves. The low shelf is fixed at 125 Hz (option to move to 250 Hz via internal jumper) with a 40 Hz peak, and the high shelf is fixed at 2 kHz with a 12 kHz peak. The midrange section of the FELiX is fully parametric, allowing you to have control over gain (Â±12 dB, detented at 0), frequency (70-880 Hz, or 670-8.0 kHz via DIP switches 3 and 4), as well as Q (0.5 to 5). Just to the right of the EQ is the Mix function. This will be enabled with DIP switch 6. Here, you can create a blend between channels 1 and 2. Setting it to 12 o’clock blends both signals 50/50. If the DIP switch is set to A/B mode, then the footswitch will be used to toggle between channels 1 and 2 (an LED indicates which channel you are currently on). The A/B mode is exclusive, so the channel not currently selected will be muted. This mode can be useful when switching between two different instruments on the fly. Next in the chain is Boost control. Boost is activated with the corresponding footswitch, and ranges from 0 dB to +10 dB when fully clockwise. This is a global setting that will add boost to every output signal. Use caution if you are using a microphone or pickup that is prone to feedback; start small before you try to push the FELiX to 11. The sound crew will thank you for it! Other features on the front panel include a Mute footswitch and an amp/phones output pot. 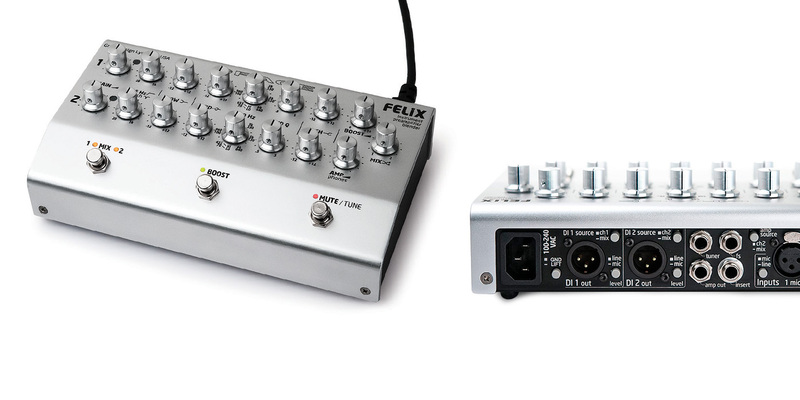 The Mute footswitch affects all FELiX outputs excluding the tuner and headphone outputs. This allows you to tune (or practice with headphones on) without sending signal to your amp or to the mixing console. The amp/phones volume control adjusts the volume for the amp and headphone outputs. FELiX is strapped with impressive I/O capabilities. The back panel has XLR jacks for input 1, DI outs 1 and 2, as well as unbalanced 1/4″ jacks for inputs 1 and 2, amp out, tuner, footswitch, and insert. The FELiX takes a standard IEC power cable for its internal power supply. 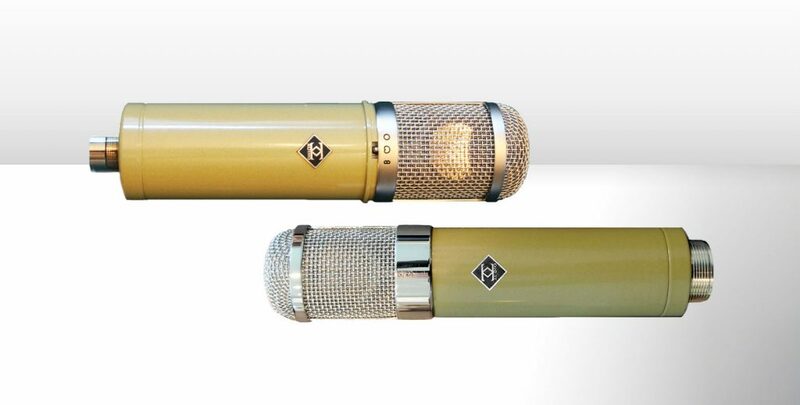 The XLR input features a transimpedance mic pre designed in the style of Grace’s m101. Each DI output is balanced and transformer-isolated, armed with a source select switch. This switch allows you to assign each output to the individual channel, or an option to send a mix of the two channels (adjusted by the Mix control on the front panel). Sending each output individually is ideal for singer/songwriters, or musicians using a different instrument for each channel. Sending the output as a mix of the two inputs is ideal when blending two input sources on one instrument — a mic and a pickup on one guitar, for example. The output capabilities can cater to just about any application you can think up for the FELiX. There is also a mic/line switch for each output, depending on what input source you are feeding. The mic setting is designed for a mic input on a console, padding the signal down -26 dB before sending it out. The line setting is not padded for level matching, and is intended for line level inputs at the console or interface. 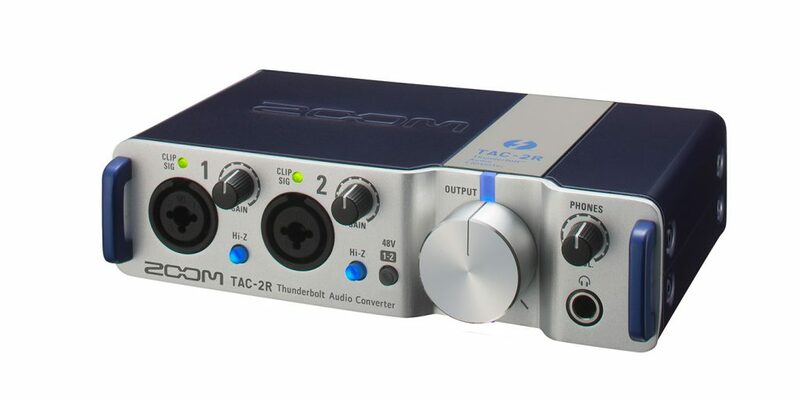 There is a dedicated, level-controlled amplifier output, which can be sourced from the mix or channel 2. 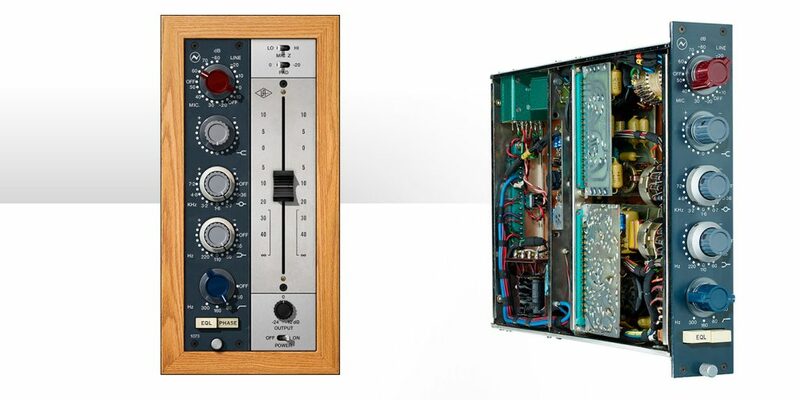 The insert connection is designed to use outboard effects with the FELiX, and is placed in series with the blend signal (post boost). After trying the Mic input, there is no question that it comes from the same family of preamplifiers as the rest of the Grace line. I tried a variety of microphones and sources through it, including acoustic guitar, percussion and vocals. I don’t have much to add to everything that has been stated in our previous reviews of Grace mic preamps, other than what makes this particular one stand out — it’s designed to be used on stage. The FELiX brings that familiar Grace detail, headroom, and magic sense of clarity to every gig. No, this isn’t a mic pre dripping with character; it lands more on the transparent and clean side — which, for live situations, should give you peace of mind. There are plenty of variable elements on a gig-to-gig basis; this unit is a consistently clean and accurate preamp that you can rely on to get your sound, every time. The EQ is overall very musical and easy to use. The highpass filter is transparent and flat. The selectable notch EQ for the low octave sounds very musical, and is quite precise for making surgical EQ moves at 1 kHz and below. The low shelf adds more body and depth to a signal that may be lacking low end; in my time with it, it hasn’t made any source become too boomy when used in moderation. By the same token, the shelf does a fantastic job at taming low rumble and mud of bass-heavy sources. The parametric midrange is great for making gentle bumps or scoops, providing a nice lift to help cut through the mix if needed. The highest Q setting for the midrange goes to 5, which is tight, but not quite to the same extent as the notch filter in the low octave. To my ears, the midrange works best when using a wider Q and making subtle adjustments. The high shelf really opens up the top of the signal, adding brightness without becoming brittle. After using the EQ on several different instruments, I found myself making the majority of my moves on the high and low shelves. These work together really well to shape the overall tone in a smooth way. Getting your sound live is no different than in the studio — it starts with a great source and a great room. While some of this is out of your control on a gig, you can still control some elements to help shape your sound. Most of the time at the venue, you plug your pickup straight into a DI box, which doesn’t always lead to musically inspiring results. Plugging your pickup into a box like the FELiX — even before touching the EQ chain — adds detail, an open and musical top end with a deep and accurate bottom. The mic pre on its own won’t fatten the signal, but it will capture what is there and translate it in a very pure way. That is an element, especially in a live setting, that can really bring your show to another level. There aren’t very many options on the market right now that can do this with the same grace (sorry) as the FELiX. The instrument input is equally impressive. Similar to the mic pre, it won’t thicken the signal, but it will capture the tone of your instrument very accurately. Depending on the pickup in your instrument, getting a smooth and balanced output opposed to a muddy or dark tone is not always easy. I used FELiX with a Taylor 210ce acoustic guitar, and found that the initial tone from its pickup was bright and could use more depth. After about 15 minutes of dialing in the EQ, I found a setup that added more body to the tone, while smoothing out the bright top end on the pickup. The setup that worked best to my ears went something like this: HPF around 80 Hz, low shelf +2 dB, with a mid Q close to 0.5, with a slight cut around 4 kHz and the high shelf rolled off about -2 dB. The result? The best-sounding tone I’ve heard yet from the direct out of that guitar! It sounds clean and tonally balanced, with no weird honks or frequency buildup. After getting both the mic pre and the instrument input dialed in, I started to blend the two sources together. I found the sweet spot around 60% mic, 40% DI. This gave the best of both: The clean, balanced tone of the DI, as well as the vibrance and energy from the Neumann KM 184 that I had placed on the neck of the guitar. After hearing the FELiX in action, I can’t imagine going to a gig without it. If you are a gigging musician that uses acoustic instruments and wants to improve your sound, the FELiX is a very logical investment. There’s something magical about a reliable mic and instrument preamplifier that you can use live with a versatile, easy-to-use EQ section, and the capability to blend two signals together. The mic pre on the FELiX is worth the price of admission alone. The floor unit design allows very easy setup and accessibility for tweaks during the show, and you can plug in a dual-momentary remote footswitch should your FELiX live on an amp or away from your feet. With the FELiX, Grace Design introduces a very impressive solution to getting cleaner, better sounding acoustic tones on the stage or in the studio.